The common ruling casual conversation in 18th century would surely astonish us today. On one side in contact with high nobility an etiquette, which demanded the spanish reverence in attendance of emperor and empress, that means falling down on both knees and getting guaranteed the mercy of a kiss on the hand. On the other side inconsiderateness against equal or lower people. During audiences, for example the Lever, only the King had the right to use an armchair with arm-rests, if not any other crowned head was present. The king's family sat on chairs without arm-rests, princes and princesses on simple stools, everyone else had to stand erect. Not until the frequent coincidence of the sexes the conventions were refined. Besides France gave the ideal. The esthetic Parisian salons, the famous "bureaux d'esprit" of the ladies Tencin, Geoffrin, Lespinasse, du Effand and others, who brought together the most ingenious men with the most beautiful women in their convivial gatherings, setted the tone of a refined society, which was admired and imitated throughout whole Europe. 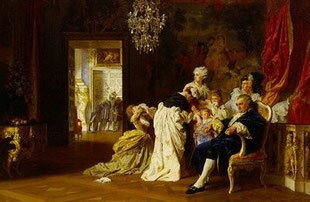 Marie Antoinette eased the etiquette at the French court according to the above ideal. Common meals with the relatives of the royal family where her idea. Shaking hands on the French court became known by the English. Marie Antoinette was amused when english ladies and gents shook hands. Marie Antoinette eased the etiquette a bit and cultivated simple manners with her confidants in Petit Trianon. But only few persons had admittance there. In the public and at the court contact between sexes was frowned upon, at the very most contact of fingertips. Also here Marie Antoinette gave an ideal by holding hands with Louis Auguste. Till the mid-ages there were no defined table manners. Only after the crusades the high nobility got to know about the oriental table manners. The former table manners where fixed in written form as so named "table order". Since then some parts of this theme have changed - others are still actual. The roots of our table manners are in France, which itself adapted the italian table culture. Especially King Louis XIV celebrated the rules at the table. We owe him the introduction of the fork, which was classified as devilish till then and wasn't used by fear. All at once it applied to be crude, to stuff in gorgeously smacking, to spit in the table-cloth or the throw back the gnawed bones into the common bowl. Today there is a whole band width of table manners and conventions, which are right and adequate to the situations. Modern human eat by fingers in fast-food-restaurants, by chopsticks in china-restaurants and uses the single parts of cutlery fluent and with the right course in a gourmet mecca. Otherwise place (restaurant) and environment (group of people) purport the rules. On a fair chicken wings are fingerfood, in a canteen they're not. A lady in a companionable round with friends at the favourite Italian wouldn't be blamed when she tightens discreetly her lipstick. At a business or banquette dinner this action would be taboo. 2. Don't talk with mouth full. 3. Only start eating when everyone has got his meal. 4. Sit at the table in correct carriage. 5. Know which meals are eaten with cutlery and which ones are fingerfood. 6. Look after the right handling of cutlery. 7. Don't brace elbows on the table. You should look after this point generally, equal whether you're in pizzeria or in a gourmet mecca. The easier the gastronomy and the more trivial the event, the easier some smaller breach against the table manners will be forgiven.